Learn how to reload ammo for rifles and pistols, benefit from expert step-by-step instruction, helpful images, advice on tools, and much more. If you’re an avid rifle or pistol shooter, chances are you’ll benefit greatly from learning how to reload ammo. 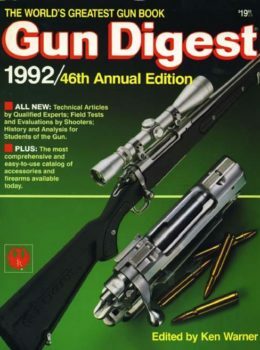 Luckily, the process of handloading or reloading your own ammunition is explained in great detail in Gun Digest Shooter’s Guide to Reloading by Philip P. Massaro. Filled with illustrations and step-by-step instructions, the process of reloading metallic cartridge ammunition for both rifles and pistols is clarified with both a simple overview, as well as specific details of the process. Enjoy the improved accuracy of hand-tuned ammunition, and gather the necessary information needed to get started with the reloading process. The necessary components, tools, techniques, and solutions to common problems associated with reloading are discussed, as well as recommendations for the gear you’ll need. If you’re just getting started reloading ammunition, let this book boost your understanding of different bullet types, powder types, ballistics and more before jumping into the reloading process. Even if you’re more experienced with reloading, you’ll appreciate the included advice for common pitfalls, problems, and mistakes associated with reloading your own ammo. Get ready to save on ammunition costs, improve your accuracy, and shoot more with this enlightening guide! An avid hunter from his youth, Philip Massaro has been interested in the various calibers, bullets and powders. He was mentored by his father and a dear friend who was a Vietnam-era US Marine Corps ‘expert’ shooter. Hunting big and small game in six different states, Canada and three African countries has given him the opportunity to field test the ammunition he produced, and helped to hone his skills and experience trouble-shooting unexpected tribulations. As the President of Massaro Ballistic Laboratories, LLC, Mr. Massaro has over twenty years of reloading experience. The day-to-day affairs of owning a custom ammunition company have exposed him to situations that the average handloader may not experience, requiring a level of expertise that few have. Chapter 1: A Reloading Overview: Why Do I Want to Do This? Chapter 8: Why Didn’t This Work Out?